NYCSHS “Collinwood Shop” Adds Sunday River Productions NYC Videos!!! Imagine 45 minutes of high quality video, and almost all of it in color! 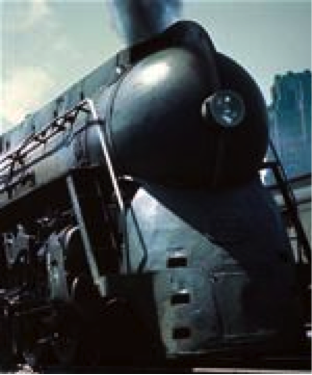 We are not talking about somebody’s old shaky 8mm home movies; this is professionally produced movie footage of typical NYC trains during the late 40s and early 50s. By “typical” you will find footage of run of the mill, weathered trains, with only a few shots of pristine public relations runs. Yes, this is file footage that New York Central’s Public Relations Department intended as filler to support its productions. Most of these vintage scenes were never used. Long time NYCSHS member Richard Nadel carefully saved these images for future generations. Lightning Stripers concentrates on diesels, but steam is not forgotten. Steam, of all kinds, is the center of attention in Hudsons Along the Hudson. Freight car historians take note; the camera does not shut off just after the locomotives roll past. You will be treated to lots of equipment in various shades of boxcar red, black, gray, and brighter reefer colors. Ever wonder how to weather hopper interiors, gons or car roofs? You’ll get your eyes-full from overpass vantage points. Most of the scenes are along the Hudson, Mohawk and Syracuse Divisions. Those familiar with NYC’s transportation plan will be able to pick out the auto, meat, perishable, and mixed freight blocks within the passing trains. The original prints were 16mm, so the image quality is excellent. Then there is the narration. The voice is pleasant, and there are long pauses while you enjoy the train sounds. Besides work-a-day freights, you’ll see Dewitt’s hump yard in action; early 40’s Twentieth Century Limiteds racing through scenic tunnels behind Dreyfuss Hudsons; about every streamlined train the Central fielded during daylight hours; commuter runs; Sharks, F’s, PA’s and C-Liners; crews working; passengers boarding – in other words, another day in paradise along the New York Central! “Lightning Stripers” – diesels with steam not hiding in the background – finishes with Aerotrain & Jet RDC scenes – 45 min. – DVD – $27.96 for NYCSHS members; $34.95 non-members. Shipping extra and Ohio residents add 8% Ohio sales tax. 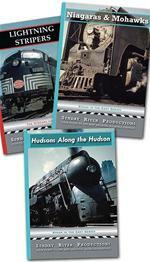 “Hudsons Along the Hudson” – all sorts of steam action, with some encroaching diesels – 30 min. of bliss – NYCSHS members $23.96; non-members $29.95. Shipping extra and Ohio residents add 8% Ohio sales tax. “Niagaras and Mohawks” – steam of all kinds, starting on the west end and migrating east – about 30 min. 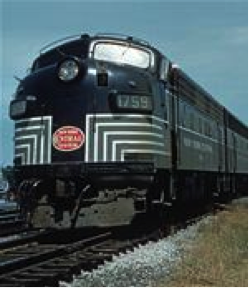 & includes about 7 minutes of vintage CNJ and Erie action. NYCSHS members $23.96; non-members $29.95. Shipping extra and Ohio residents add 8% Ohio sales tax. 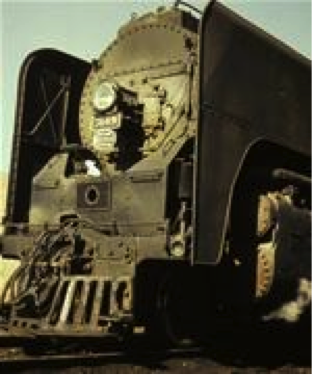 “New York Central 3-Set” – save money on shipping by purchasing all three of the above videos as a set. NYCSHS members $75.88; non-members $94.85 and with free shipping for US customers. Ohio residents add 8% Ohio sales tax. Ralph Schiring, NYCSHS Director and “Collinwood Shop” storekeeper.